I don't like xmas. I'm not going to go on about it, because I know that most of the bloggers I follow love it and do it wholeheartedly, but I don't and so my favourite time of the year is just beginning. There are many benefits to not "doing" xmas, but one I really noticed this year was that while most people were prowling the aisles of the supermarkets being super-organised with huge lists, the charity shops were almost empty. Although I've yet to find a candle that really fits well in them, I still love these Dansk candle holders. They sit on the window ledge halfway up my stairs, and everyone who passes them re-arranges them. The two I bought last week will just allow more permutations. 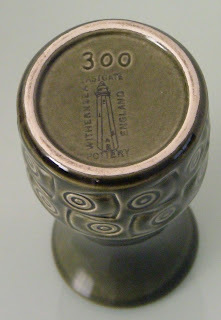 I was attracted to this little vase, and thought the embossed pattern was very Hornsea-like. It's stamped Withernsea Eastgate, and a bit of Googling revealed that Eastgate is just down the coast from Hornsea, and Eastgate pottery bought a lot of Hornsea's old moulds from them. I hope everyone who celebrates xmas had a good one. I'm not a Christmas fan either, nor is my husband or my "gown-up" children. Over the years, we've made less and less of a fuss and is is very freeing. Liking vintage is very closely tied to the reasons I don't like what Xmas has become. I wasn't planning to go out on Xmas Eve day, but unexpectedly ended up in one of the local thrift stores - lovely and quiet with a number of nice finds! I know exactly how you felt! 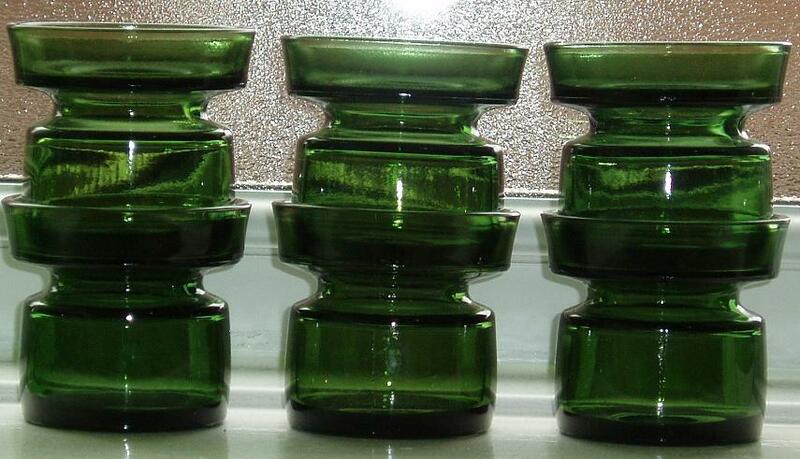 Love those green candle holders - a great find! The thrift stores here were just as busy as ever, but with less merch since everybody was too busy shopping during the past month instead of donating!! Oh, I feel the same way about Xmas as you, it has turned into a commercial monster. I used to stress about it but I have allowed myself to step away from all the craziness. I gave mostly thrifted gifts for the holiday and I hope that my family liked what I choose for them. I know I enjoyed finding their gifts more than I would have if I had gone to the box stores. The uniqueness and quality of older items can't be beat and I enjoy finding others who feel the way I do.